Bacon is without a doubt one of the most popular foods in the United States. It is delicious, easy to cook, can be eaten any time of the day (who says it is only for breakfast?) and can be paired with practically anything (soup, sandwich, burger, you name it!) However, do you know that there is another type of pork meat that is equally palatable but is more versatile than bacon? Yes, pork belly is as delicious as bacon. Are they the same? This article will discuss the difference between the two. Pork belly, as the name suggests, is a cut from a pig’s abdominal area. It is a non-cured fatty slice of meat used in various recipes across the globe. If you buy it from the meat shop or your local butcher, it is usually unsliced, so you get a whole huge slab of meat. Since it is uncured and unsmoked, it is pretty versatile and can be used in different recipes. It is usually cooked by braising, deep-frying, or roasting. Regardless of how it is cooked, the meat will become tender and the fat will be so soft it almost melts in your mouth. Bacon is a cured meat from pork. The curing process involves soaking the meat in a salt bath then drying it to prepare it for boiling or smoking. Although bacon undergoes a thorough process for curing, it is still normally cooked prior to consumption, usually by frying, baking, or grilling to achieve crispiness. 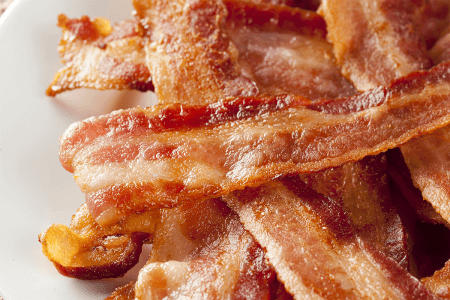 In America, the term “bacon” refers to the most common type of bacon available: the streaky bacon. The streaky bacon is a cut of meat from the pig’s side or pork belly. It is the familiar fatty strips of meat that have a rind. However, bacon can also be prepared from different parts of the pig like the loin, back part, cheeks and shoulder. Additionally, due to religion and certain rules in diet, non-pork bacon varieties have become increasingly popular. You may find beef bacon, chicken bacon, turkey bacon and even lamb bacon sold in stores these days. Many people find bacon very appetizing which is why it is widely eaten for breakfast (usually with eggs), as a sandwich or hamburger filling, or as a pizza topping. It is important to note, however, that because of the curing process, bacon has a high sodium and nitrate content which may cause high blood pressure, heart diseases, and cancer. What, then, is the difference between pork belly and bacon? 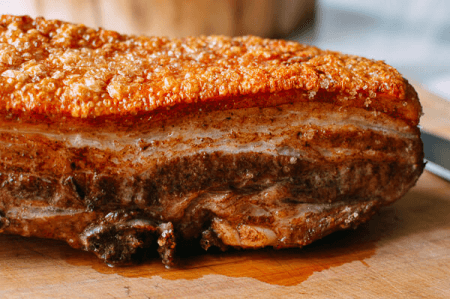 Pork belly is an uncured, unsmoked whole slab of meat from a pig’s abdominal area. It is fatty and usually comes with skin. On the other hand, bacon is a long thin slice of pork belly. It is cured and is typically smoked. Although bacon is commonly prepared from pork belly, it can also be from different parts of the pig. Non-pork bacon varieties are also available. Moreover, pork belly is raw unprocessed meat so it can be used in practically any recipe that calls for pork. It can be cooked by frying, braising, roasting, or deep frying. Bacon is a processed meat but is typically still grilled, baked, or fried to achieve crispiness before consumption. Additionally, bacon is processed food and contains a high level of sodium and nitrate from the preservatives, while pork belly does not contain added components since it is uncured.